I still remember clearly the exhibition of Christian Boltanski held in Marian Goodman gallery Paris in 2005. I can also recall vividly the impact of the moment when I entered the pitch-black room separated by a curtain after going through the installation which reminded me Giacometti’s sculpture, “Walking Man”, the black court was hung on the wood board, and downstairs. I rushed into the exhibition on the final day because I hard that we could meet his world of “The Heart” inspired me three years ago in La Maison Rouge in Paris again. I bought the ticket at the entrance as usual and opened the glazed door to go into the passage connecting the reception to the exhibition room. “Did it always smell like this?” I wondered and hastily worked toward the exhibition room on the way smelled sharply like antiseptic solution in a hospital. There were the usual passage except the smell, the wall painted crimson, mauve and khaki and the long straight neon on the ceiling. However, my heart throbbed. So it had already heard of the sound of that “Heart” here. Doc. Doc. Doc. Doc. Reaching to the hall in front of the exhibition room, I stopped with momentarily. ” Qui êtes-vous ?” (Who are you?) The masculine voice thrown out somewhere to me. Why I felt such fear without evildoing? Who am I? 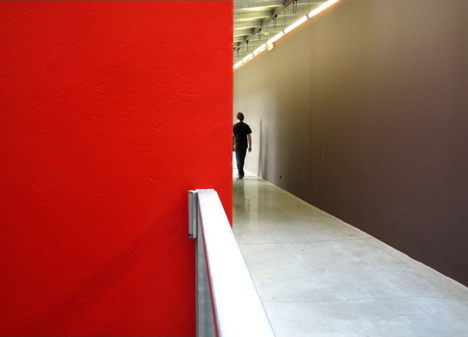 This passage was not only connecting the entrance and the exhibition room. It had already been his work where I passed hastily through. I couldn’t be stand here long time. Somebody said to me “who are you?” but there was no one else to reply to except me. After calming down I entered the installation, “The Heart”, sounded Boltanksi’s heartbeat. There was only one light bulb flicking on and off to the rhythm of the heartbeat in the center of the pitch-black space as three years ago. Of course, so did the sound of Bontalski’s “The Heart” which shook my heart. Waiting eyes accustomed to the dark a little while, I advanced toward the back of space, there were various sizes of jet-black boards on the wall. Judging from its size and frame, I thought this was his forte portrait and looked at it carefully but I saw nothing but black. Moreover the bulb prevented to visitors seeing them clear in the room. Advancing along the wall, I came across the huge amplifier. The sufficiently handmade works of the amplifier and the wirings were in opposite to perfectly sophisticated works, which were like industrial products, represented by recent American contemporary artists. It seemed as if his heart that the amplifier wrapped up by black plastic sounded his heartbeat. It sounded low regular rhythm and not and seemed to shake walls, ducts of ceiling, structures of exhibition rooms, our bodies, and entire building of La Maison Rouge. 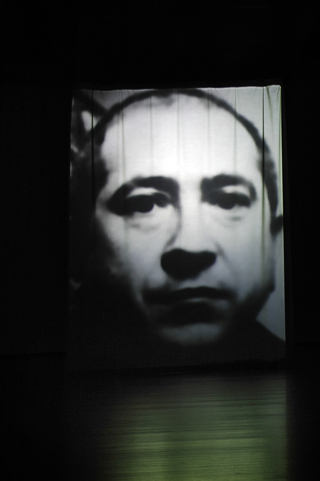 There is no concept of unique piece (the one piece of work) in Boltanski’s work. The great changes of his work depend on spaces of exhibitions and some elements are added and another elements are eliminated. Actually, there were big differences between the work “The Heart” in this exhibition and the work “The Heart” which was the first piece in 2005. When I advanced from the entrance of exhibition to the back of it and suddenly turned around, monochrome photographs of his face from childhood to present were displayed onto the big screen by slide projector as well as black portraits. The echoes of heartbeat in the hall and the light. First of all visitors associated the work with a continuance of life, when their heartbeats were synchronized with the rhythm of work, Doc. Doc. Doc, they couldn’t help feeling the stream of time to go forward the state of death in front of his portraits for 60 years. Moreover, Just as they were wrapped in the installation as the center of such a limited life, the fear that it got into the countdown to the end of the world fell upon them. There was the project that he began starting with this exhibition except above-mentioned three works: Qui êtes-vous? 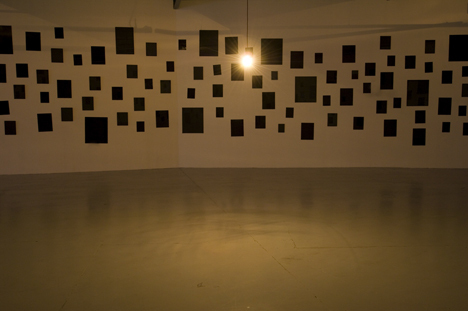 (2008), Le Cœur (2005) and Entre-temps (2003). It is Ieshima project, “Christian Boltanski’s Archives from the heart”, started from the consignment that one Japanese art collector said to him “Could you do something interesting using the island in the sea of Japan?” Visitors can record their own heartbeat in the recording studio at the corner of the floor and take recorded CD out. Those sounds of heartbeats will be preserved in Ieshima as “Archives from the heart”. Who wants to record own heartbeat should get order ticket and wait his turn at the hall combined a waiting room. There was a pregnant woman holding her big stomach, a baby was nearly to be born. I wondered if she would be able to hear two sounds of heartbeats from her CD. The sound might not be able to be taken because it was surely too small but it was a very wonderful spectacle. This project goes on collecting these recordings alongside other projects that will be put to him over the next few years, as well as next exhibition at “Magasin 3” in Stockholm, and preserving the added archives infinitely on Ieshima. 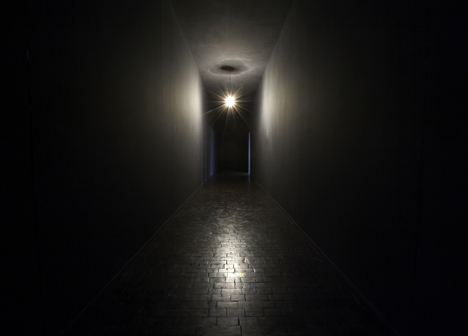 We associate the work of Christian Boltanski with memories, as he calls “Small Memories” which are extremely fragile and vanish with death of individual and remain with individual’s heart, against handing down them from generation to generation through history books and memories of general public. Till now, his work didn’t come up with to “preserve” memories but it just close them or awoke them to us. I remembered the interview that Boltanski who would be 65 years old in the year often thought about “death” in the process of getting old. Was it the expression of “preservation” completely opposite to “death”? On the occasion of writing this article, I translated French phrase, “les archives du coeur”, into “Records from the heart” in the exhibition title and into “Archives from the heart” in the project name. I wanted to write “mind/heart” like one word each time when I wrote “the heart” but I didn’t want to add anything to the object created by the artist. The reason why I used the words of “Record” in the exhibition title and the word of “Archive” in the project name because I thought that this exhibition had the concept of “Records of the heart = memory” and this project had the concept of “Archive” like libraries and museums. However I didn’t use the phrase, “Archives from the mind”, but the phrase, “Archives from the heart” because I might feel something emotional in the project. Thus, it is the world of Boltanski that a work, it seems simple at first sight but includes various meanings, gives us freedom of various interpretations. He is the creator of Monumenta 2009, it is new contemporary art event providing contemporary artists with the opportunity to engage with the great steel-and-glass nave of Paris’s Grand Palais every year. In the art scene, it is said that the installation of “The Heart” will be displayed in new style in very hard space, Paris’s Grand Palais. I’m impatient for it to start.